Hey, this movie’s got Meryl Streep. That probably means it will be up for an Oscar…and wow, there’s Phillip Seymour Hoffman! He’s the male acting equivalent of Meryl Streep. And look, it’s got Amy Adams, that actress who made Enchanted watchable (what a feat)! I have to see this movie for the cast alone! This was my reacting when I saw the trailer for Doubt, and I’m sure my reaction was shared by many others. It’s undeniable that the cast assembled for Doubt is amazing, and as expected, everyone gives an Oscar-worthy performance. The film’s selling point is the actors, and it’s unsurprising that the performances are the movie’s best element. However, once you get past the grade-A thespians expertly applying their craft, you’ll realize that what makes the film memorable is the sharply written, exceptional thematic material. It’s a deep movie driven by inspired actors, and that makes it successful. The film takes place in the mid-1960s at a Catholic school in the Bronx, where Principal Sister Aloysius (Meryl Streep) has put the fear of God into all of her students. Father Flynn (Phillip Seymour Hoffman), an inspiration pastor, is spreading the words of acceptance, kindness, and love, which is a bit too outside the box for Aloysius. When Sister James (Amy Adams) voices to Aloysius her suspicions of Father Flynn’s relationship with the lone black student at the school, Aloysius begins a vendetta against Flynn without a hint of doubt in her mind. Playwright John Patrick Shanley adapted and directed his highly-acclaimed stage play for the screen, and one of the few weaknesses in the film comes from the lack of innovation at transferring the story from stage to cinema. Once in a while, the film takes advantage of the movie-medium (especially in the opening sequence which intercuts Flynn’s sermon with Aloysius walking down the rows of pews ordering kids to pay attention), but most of the time, the film does little to distinguish itself from the play. It’s paced like a play, with entrances and exits and a conservative use of sets. There are only three or four major sets, and there are plenty of scenes fifteen to twenty minutes in length that never change location. This is a common problem with stage adaptations, but Frost/Nixon proved that you can turn a play into a movie without the audience ever guessing that this was once done on stage. Still, the stage-like pacing doesn’t hurt the movie on the whole, and cinematographer Roger Deakins manages to make the camerawork dynamic nonetheless. 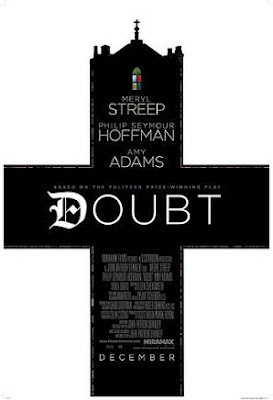 Doubt isn’t so much about plot as it is about themes; the set up of an obsessed Nun and a nice pastor is simple, but allows Shanley to explore some pretty complex issues about authority, morality, kindness, religion, and acceptance. Sister James is almost like the avatar for the audience; she doesn’t know if Aloysius or Flynn is the one to believe, and her conflictions as the film goes on mirror those of the audience. There are an equal number of scenes between her and Aloysius and her and Flynn, and each character has something to teach her (though Flynn’s advice is the stuff to take to heart). Indeed, the film’s best scenes come from the two leader’s trying to convince Sister James one way or the other. Two sermons by Father Flynn, each serving as a dénouement to a section of the story, also give the film thematic weight. Sister Aloysius’ discussions with Flynn or other characters examine the themes associated with her character. Numerous other small sequences, many of which have no apparent relevancy to the plot (like a dinner or a basketball lesson) simply add to the atmosphere and get us closer into the minds of the characters. Because of all of this, Doubt may feel slowly paced; it isn’t. It’s deliberately paced, and the film’s immediate knowledge of how fast it wants things to go forward is a big asset. Some of this deliberate pacing is shattered by the ending, which comes far too quickly and, perhaps, conveniently; the scene that is essentially the finale just feels like the opening to another act, and it’s a bit off-putting. Thankfully, the ending is ambiguous enough to save the integrity of the rest of the story, and in the end, the film feels very powerful. Meryl Streep has more Oscar nominations than any actor or actress in history, and for good reason; she’s terrific in just about any role. She’ll definitely earn another nomination for Doubt, and it’s well-deserved (though the cruel aspect of the character isn’t exactly a stretch for her). Aloysius is a cold, cruel, calculating witch that could shatter your soul with a glance. Streep rarely raises her voice in the role; she’s as scary in her subtlety as she is in her ferocity, the hint of a New York accent she infuses into her voice doing plenty of the work. Streep is 100% effective in the role, putting fear into your heart and sometimes making you laugh at her incessant cruelty. Phillip Seymour Hoffman, however, gets the film’s best moments. Not only does he nail every sermon he gives, but he has a kind, understanding quality that can only come from an actor of his caliber. My favorite scene in the film might be a small conversation he has with Sister James, where he tells her that love and compassion are not weaknesses, but virtues, and explains that people like Aloysius have forgotten that those virtues are exactly what Jesus died for. It’s a poignant bit of writing mixed with brilliant acting, and the result is an immensely powerful scene. Amy Adams is quickly emerging as one of Hollywood’s best young actresses; the fact that she easily holds her own with the likes of Streep and Hoffman speaks volumes about her performance. Sister James is a very nice person, who is conflicted by the clashing philosophies of Flynn and Aloysius, and few actresses could so effectively bring this sort of personality to life. Adams has a special, endearing quality, and I wouldn’t mind seeing an Oscar nomination for her performance. The other major member of the cast, Viola Davis, plays the mother of the boy Flynn is accused of molesting. She has only one major scene in the film, where Aloysius meets with her about Flynn. Davis doesn’t quite hold her own against Streep like Adams does, but she certainly isn’t overshadowed and her ten-minutes of screen time are memorable and powerful. A story with such depth in its themes needs great actors, and Doubt is a perfect marriage of these two elements. As a stage-to-film adaptation, it’s not as successful as Frost/Nixon, but it is a powerful, memorable film that stands among the best of the year. Highly recommended.